The unique TOURBILLON Orange comes with an ultra-light case made of brushed titanium and a freshly sporty look thanks to its colour combination of bright orange and grey. The orange solid silver dial is adorned with Arabic numerals and handmade hands. 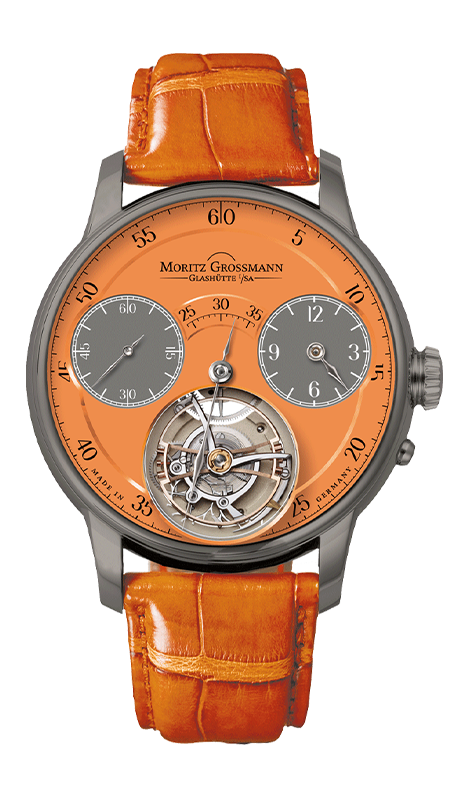 The instrumental character of the TOURBILLON Orange is accentuated by the finely divided minute scale. The subsidiary dials for the hour and second display are grey to match the titanium case. An opening at 6 o’clock reveals Grossmann’s unusually large and flying three-minute tourbillon. The TOURBILLON Orange Titanium is offered with the calibre 103.0 in the high artistic hand finish as a single edition 1 of 1. Discover everything about the heart of the BENU Tourbillon.